A successful validation of Drillsoft® hydraulics software transient well model was carried during the drilling operation in deep-water well in West Africa. Using Pressure-While-Drilling (PWD – measurement of downhole annulus pressure and temperature) to compare the measured ECDs and static mud densities with hydraulic transient model predictions. This article present actual pressure and temperature data during drilling and reaming operations collected using PWD tool located at 30 m from the bit. These data were obtained from West Africa well with a 16.5” section of 800 meters drilled with oil-based with mud densities between 9.0 ppg and 9.2 ppg. The data were compared and interpreted with Drillsoft transient model, which included the effect of pressure and temperature, rotation, tool-joint effect, cuttings load, and fluid optimization. 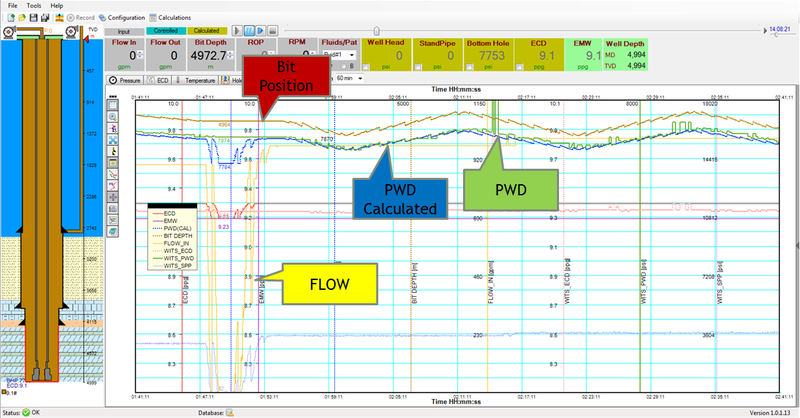 The sampling rate for pump rate, bit depth, rpm, ROP, WOB was two (2) second and for PWD was thirty (30) seconds. 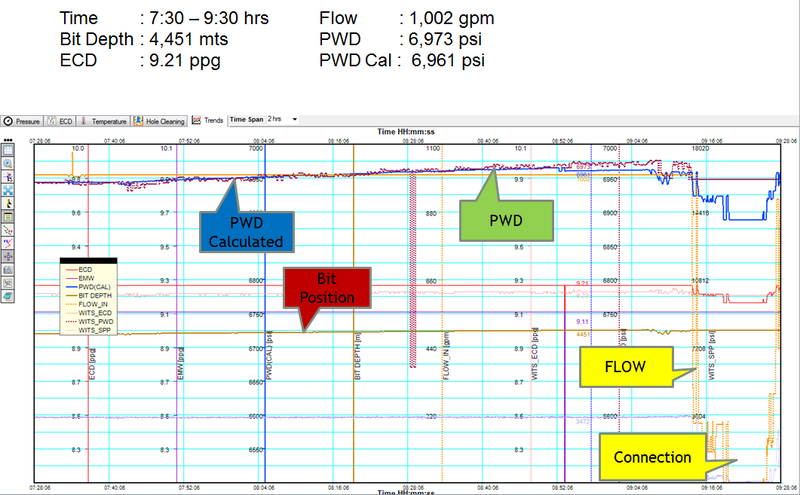 Model prediction of downhole pressure behavior we in excellent agreement with the measured PWD data. 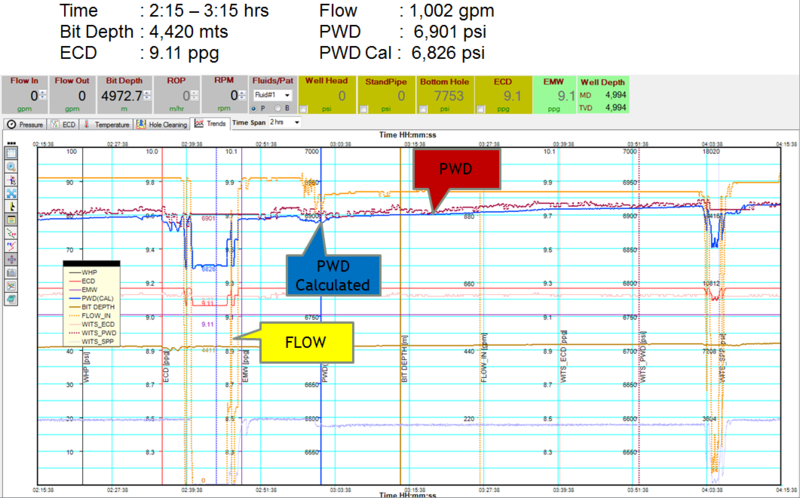 PWD/MWD tool requires a minimum flow rate of 650 gpm, under this flow rate PWD data did not change. Following screenshots were taken from Drillsoft RT, it shows a two-hour window with different variables. Figure 1- Reaming Operation, bit depth moving and pumping. 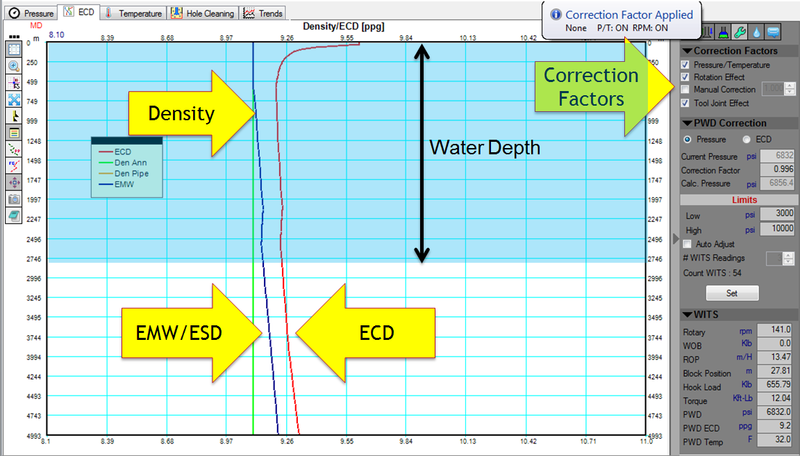 Figure 3, shows the importance of the Temperature and Pressure and how they affect the equivalent mud weight (EMW) or ESD (Equivalent Static Density), that affect the overall accuracy in bottom hole calculations. 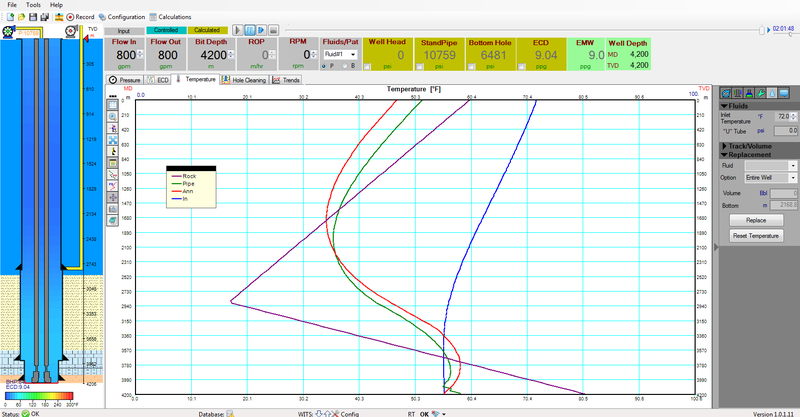 Figure 6-Temperature profile after 5 continous days drilling. In offshore well is necessary to validate the temperature profile as accurate as possible since the gradient temperature is different globally. Different studies suggest the gradient temperature for Gulf of Mexico, Brazil, North Norway, West Africa, Atlantic frontier. 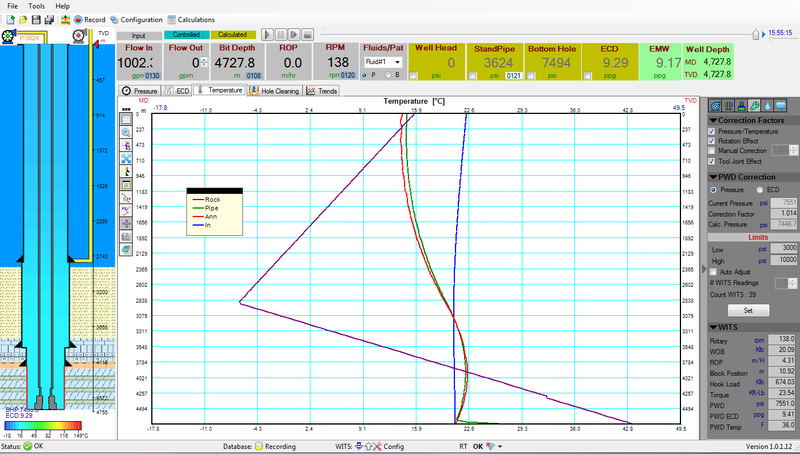 The result shown accurate prediction for pressure and temperature in a complex well. Drillsoft will continue validating its hydraulic transient model in different wells with different wellbore’s geometries and fluid densities to achieve a comprehensive validation and provide quality software assurance. Also, it is very important and highly recommended to optimize fluids and monitoring fluid properties by measuring Fann readings and density at least 6 hours of operations (drilling) since the fluid change continuously especially during drilling operations.